For several years in a row, my youngest was diagnosed with pneumonia. It came as no surprise that the onset fell on anniversary (5th, 6th & 7th) of Tom’s death. As an ex-pediatric ICU nurse, I knew all too well how bad it could get. As a result of this knowledge, I used everything in my skill set to insure his recovery. Until my own diagnosis with pneumonia, this past month, I had no idea just how much the illness could affect your heath and well being after the acute phase has ended. For the most part, I feel much better. However, I am still coughing in spite of finishing my course of antibiotics 2 weeks ago. *cough* It’s frustrating. This past week, I re-initiated my OCR training efforts once again. I am making progress, albeit minimal at this point. Nonetheless, I am encouraged – most days. Rather than self-bash, I am making an attempt to celebrate the little successes as much as possible. This requires a fair amount of effort as I easily fall back into comparing my fitness level to the Juls of yesteryear, especially where running is involved. completing 30 burpees (broken up into sets of five). It’s not much … but I can’t afford to let myself get hung up on how much more progress I need to make. I just have to keep the effort up and make as much progress as possible (without getting injured) between now and June 9th. Hopefully, it will be enough to have a fun and successful Spartan Race. Time (and training) will tell. Until then, I am simply going to hold on to each and every little success and not give up. As I noted in my post to K-B, my training hit its first obstacle when Monday arrived. I do not intend to give up my well established morning yoga practice and therefore I need to fit in my training during lunch or after work. I never was good at going out for a run after dark. I’m a bit of a klutz and there are a lot of uneven sidewalks and pokie-balls to bring me down. Of course, there is the treadmill option but I am still scarred (literally and mentally) from the concussion incident of 2009. Although I have run on it, I am so tense that my back pain really flares up – especially if I let go of the side rails. With my chronic back issues, I know that I must minimize the impact of running. It is also essential that I learn to lift, throw, and pull my body and heavy objects with the utmost care and body mechanics. I’ve picked up a few books so that I can educate myself on the types of activities that I will need to master and also learn how to do these movements properly. The burpee has been the first of these drills. Although similar to the movements I do regularly in my morning sun salutations, the jumping component and rapid succession makes them brutally HARD. My body was not feeling so great this week with the additional activity I had taken on during the weekend. Perhaps I took on too much too soon. My athlete’s mindset kicked in and I really went for it. After the pain set in, I backed off a bit. I have been sneaking in the strength and cardiovascular activities here and there throughout the work week. 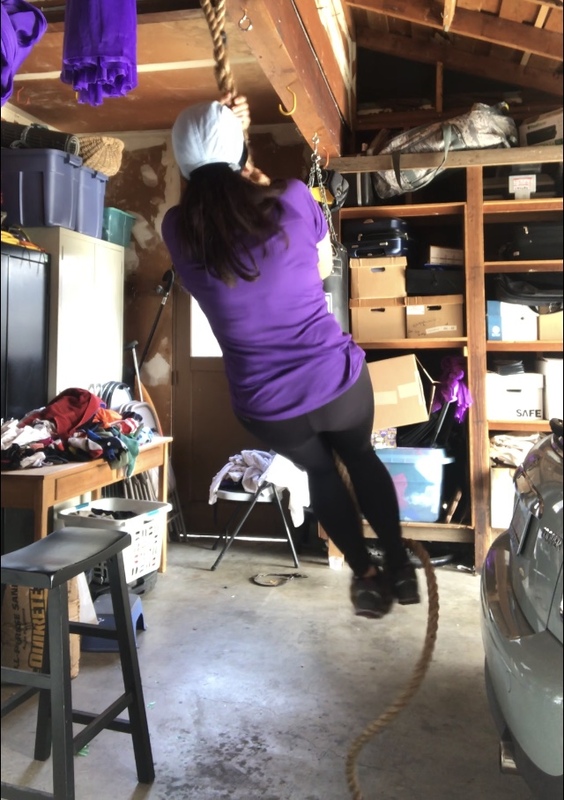 I’ve also been trying to find creative ways to get me going such as inserting some hanging from the pull up bar (hanging as long as I can hold on x 3) a few times during the day. Squat-JUMPs, lunges, and bear crawls are easily inserted here and there. I’ve found that these exercises are a lot more tolerable if they are inserted during the gaps or waiting periods that happen throughout the day (i.e. while the dogs eat or food cooks). Not only is it time-efficient but it’s just easier to day. Last night, during my Friends (by Netflix) time, I decided that I would do five burpees in the gap between episodes and five more when the theme song plays. Five seems to be my limit as that is when my low back really dips due to fatigue and lack of strength. It’s not much, I know, but I have found that if you do them throughout the day, they start to add up. Last night, I kept them up until I could no longer lift myself back up from the ground. Yes, “the ground”; I’ve learned that correct way to perform a burpee is for your chest to touch the ground before pushing back up. Once permanently grounded, it was time to turn the TV off. Tomorrow, I am going hiking with my friend, Cindy. She doesn’t know it yet but I am thinking of introducing a different version of the Burpees-with-Friends game. YaYa, who is the reason I’m taking on the race, is taking a different approach. He never stopped working on gaining muscle strength when football ended so he feels very comfortable in the gym. And even though our approaches are vastly different (at least at this point), he is my biggest cheerleader. It’s kind of like when I was chasing my BQ — only different. It’s interesting to be joining *his* race instead of the reverse. When he initially suggested that I join his team, I thought “yeah, right! I couldn’t possibly do that.” The more I thought about it, the more I just wanted to be able to do it. Not many parents get the opportunity to join their kids on such an event. This is an opportunity that I don’t want to let pass.